I have never taken something like this on before. I think that I have decided to this year because of how this collegiate year started. I was ready to throw in the towel. I had the idea of doing as much as I could with the thought that it would be my last year. It wasn’t that I didn’t want to do it, but rather I had been just puttering along for a couple of years. I was not moving forward, and I didn’t want to be that guy that just comes to games and stands on the sideline. I want my pictures to mean something. If that is not there then I didn’t have any interest in keeping this thing going. I never told anyone about my plans. It was just something that I had told myself. If things didn’t improve this whole thing was going to end. The year started off kind of slow. I normally shoot a lot of volleyball, but nothing was coming for me there. Then it seemed like a switch was flipped. I started getting a lot of requests for work. My weekends and weeks started filling up. That trend continued the entire year. As I write this I am booked for a lot of the beginning of 2018 as well. I went from working for nearly free just to get something at the end of the 2016-2017 school year to turning down work at the end of this season. It still bothers me to turn down work as I feel it is a missed opportunity, but I always go with the philosophy of the person that calls first gets me. That was a lot to say so that I could thank everyone who believed in me this past year. Without you I would be writing a completely different post right now. Your support means the world to me as I love what I do, and I want to keep doing it for as long as I can. 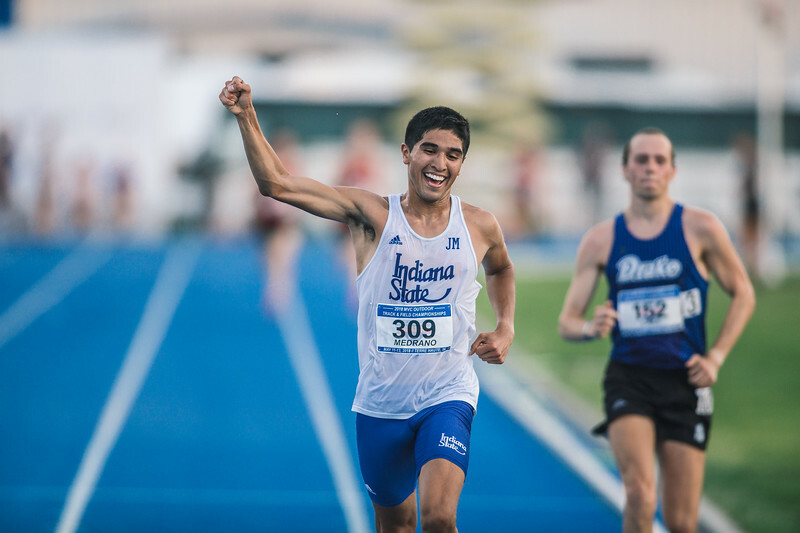 As a kind of celebration I picked out 25 of my favorite photos from this past school year. Here they are in no particular order except the order I put them in. 25. 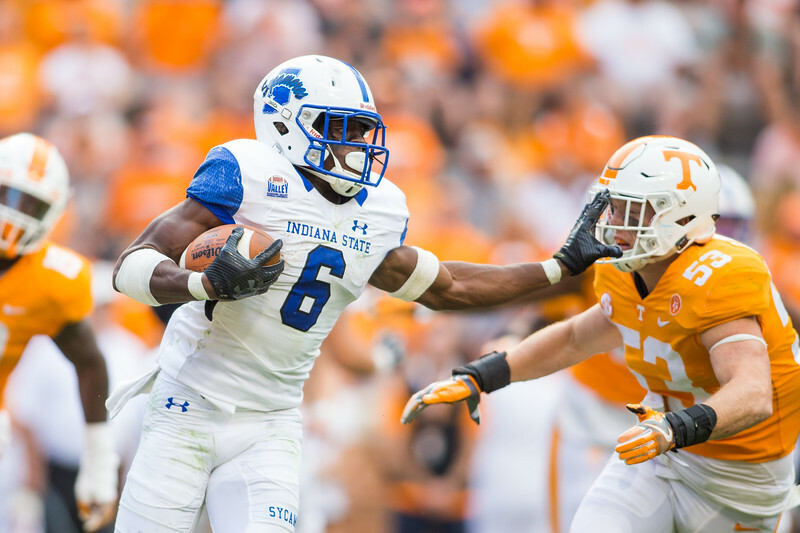 Part of the fun of this fall was traveling with the Indiana State football team. Being with the players allows you to get to know them better. 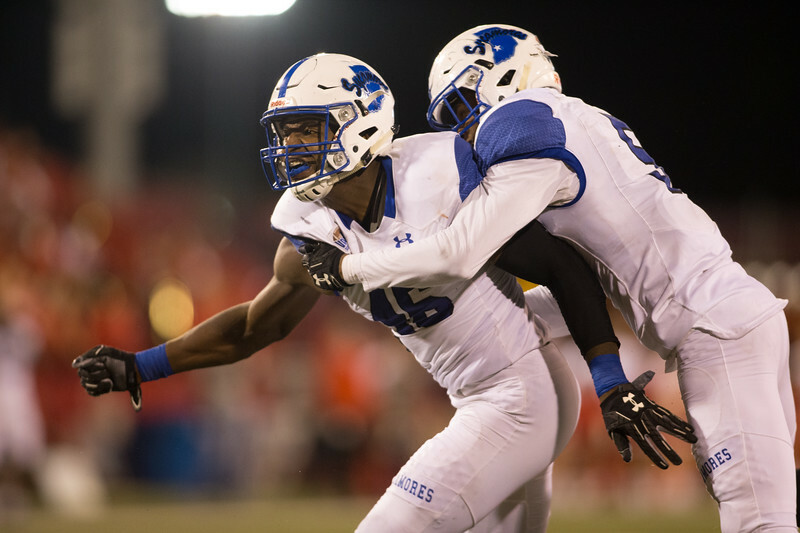 One player that I knew would be really good was linebacker Jonas Griffith. He is great on the field, but his after play celebrations are good as well. That Illinois State game was full of emotion. The two teams bring that out in each other. 24. 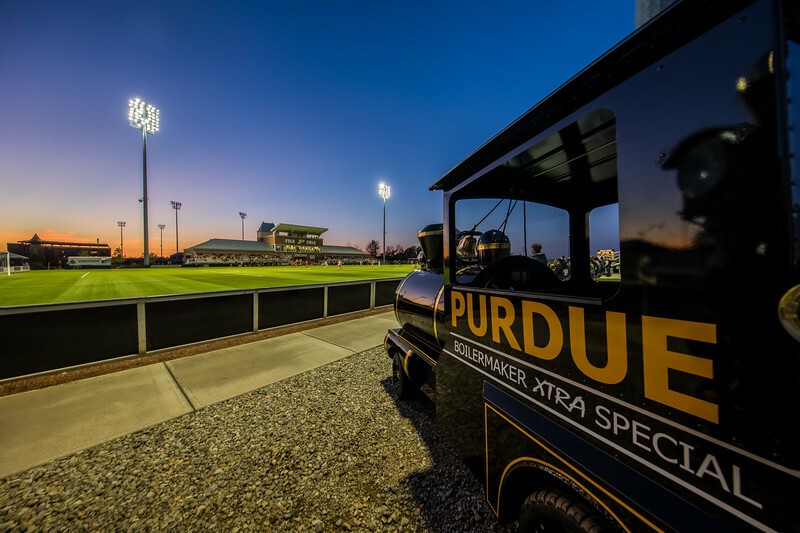 I only shot one game for the Purdue baseball team this season. It is mind blowing to me how I used to drive two hours each way on multiple days of the weekend to see the Boilers play. This year I had trouble making the seven minute drive. This year though I seemed to have things going on whenever they played at home. I was glad to be able to shoot this late season game for them. It was part of the stretch run that got them into the NCAA Tournament. What made it so cool to shoot there is that it was five years ago that I first was given a pass to shoot from the field level at Alexander Field. I really wanted to shoot there this year for that reason. I was glad that I got a game in even late in the season. The Boilers had an amazing season. They went from only ten wins, to just wanting to make the Big Ten Tournament. This year it was all about getting into the NCAA Tournament. I know what color glasses I have on when I say next year is about hosting a tournament game and getting to Omaha (a second time). 23. 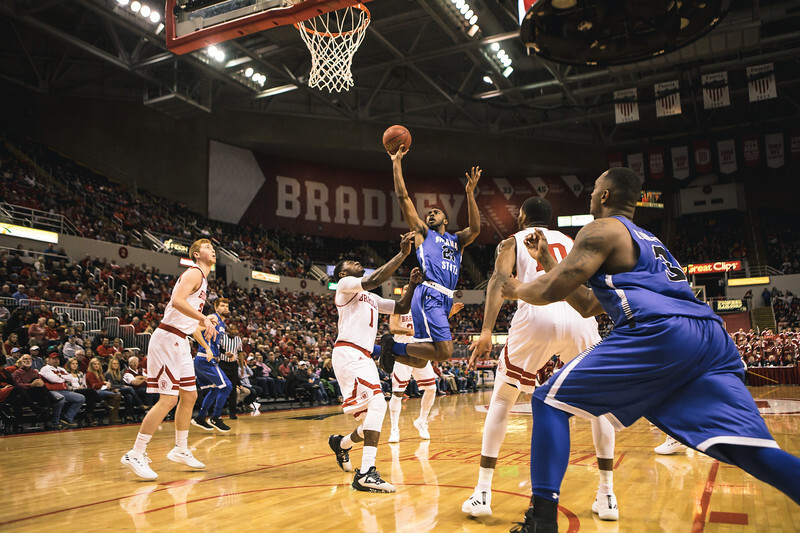 Speaking of late season runs the Sycamore basketball team had one that moved them out of day one in the MVC Tournament. 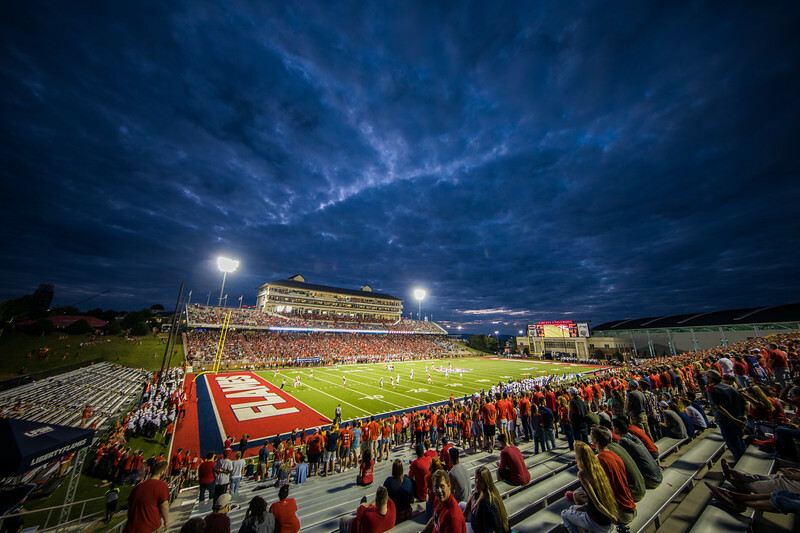 This final game at Bradley secured that Friday game for the team. I loved shooting at Bradley, and this was one of my favorite pictures from that game. 22. 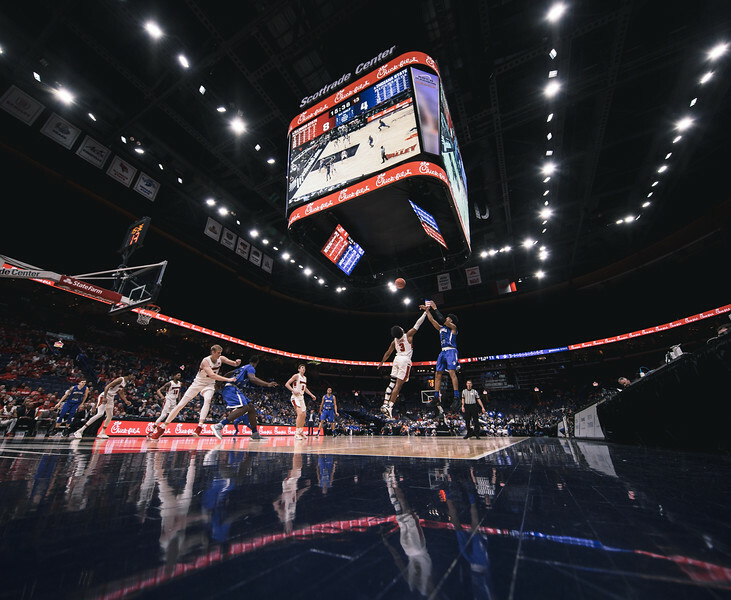 This season I shot more for Xavier basketball than I ever did before. My first regular season game for the team came at Marquette near the end of 2017. Early in the game I made this photo. I love the swagger here, and it quickly became one of my favorites from the basketball season. 21. I gave up Foo Fighters tickets to make this picture. 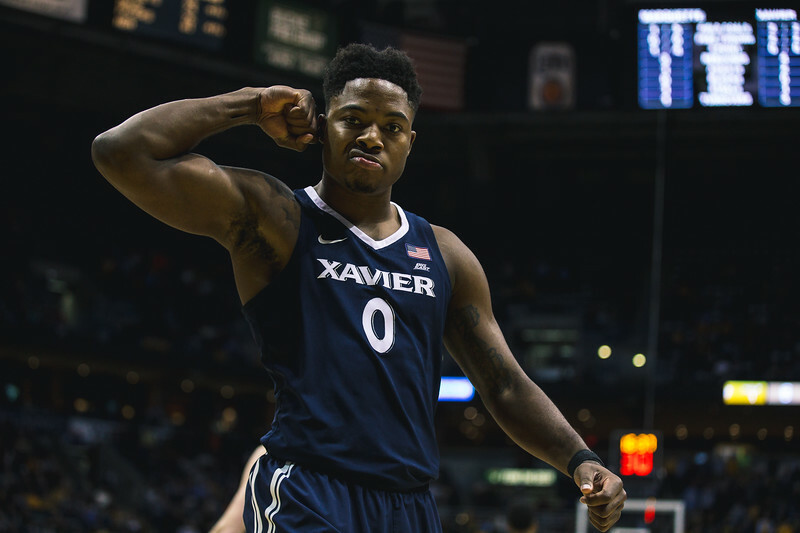 I was supposed to be seeing a rock show in Champaign, but when Xavier had their Big East Tournament game down the road from me I couldn’t resist shooting it. It was probably the best soccer game that I have ever seen. 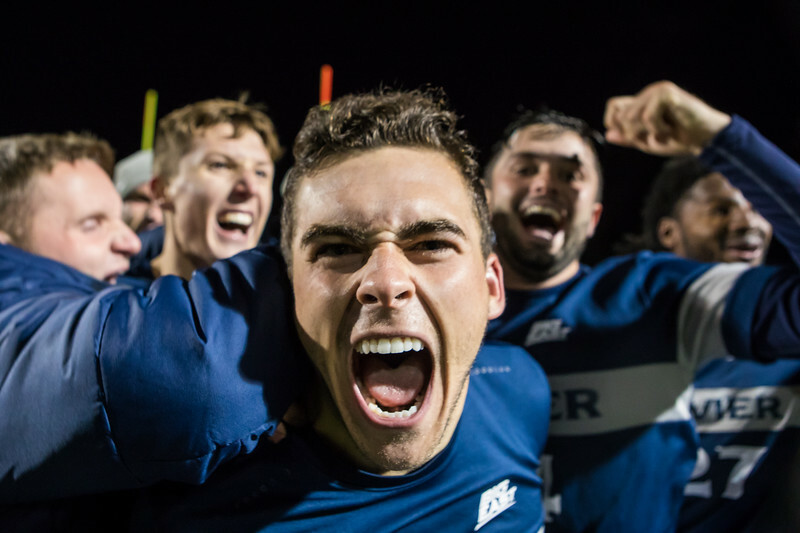 It went to penalty kicks, and Xavier prevailed. The ensuing scrum was fun to photograph. 20. I finally was able to legally be on the field after Purdue won a Old Oaken Bucket game this year. I missed the scrum for the bucket right away to make this photo of Antoine Miles. I love the sheer joy in this photo. I still made my bucket photo, but I also made something that I like much better. The sun plays a role in this photo, but it plays a major role in the next photo. 19. Sometimes everything works in your favor. 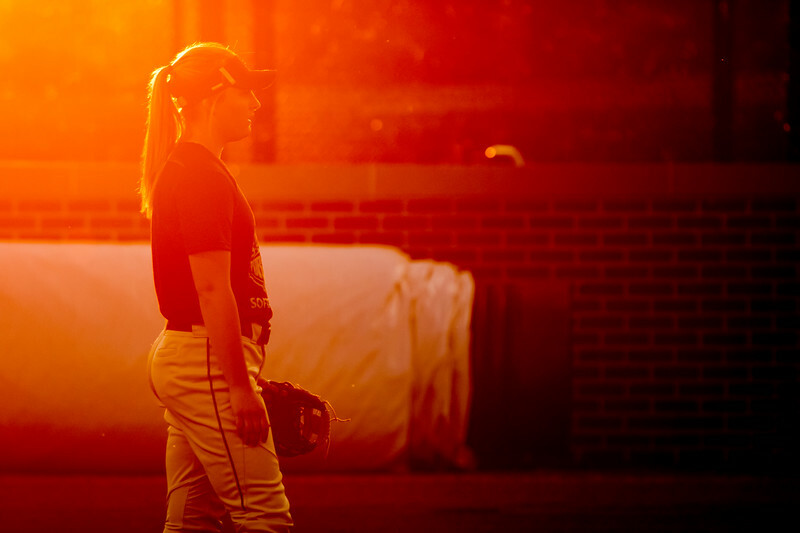 In the fall I was assigned to shoot some softball for Purdue. As the sun was going down I had an idea for a photo. I was standing on a cement base for a light pole to make this photo. 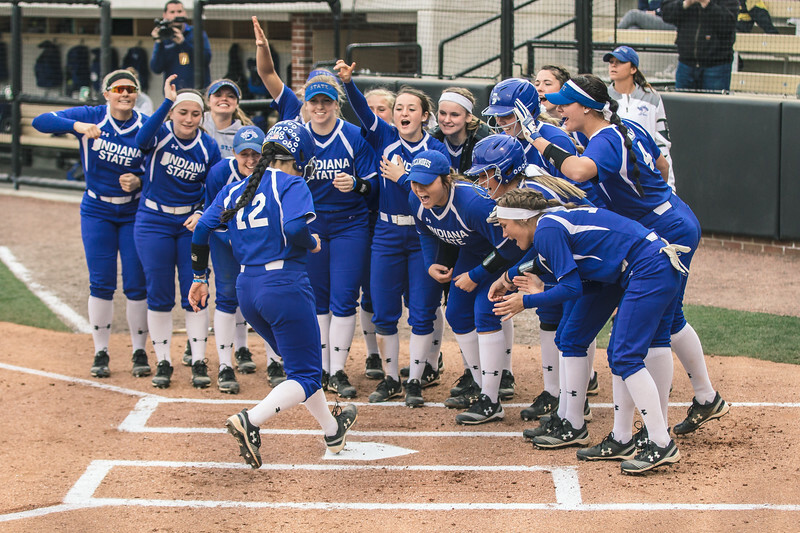 It is one of my favorite softball photos that I have made. 18. This photo was part of a fun weekend in Cincinnati working for Xavier. I shot swimming and soccer on one night, and then the Musketeer Madness event the following night. 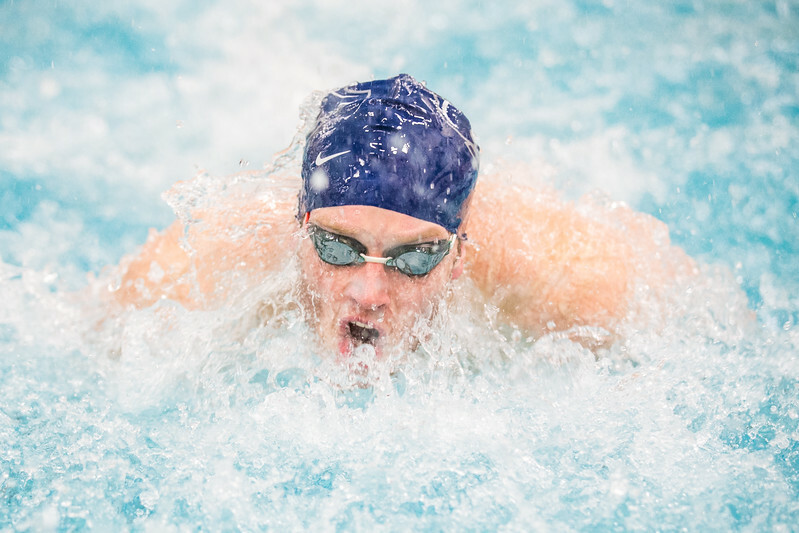 I loved this tight shot of a Xavier swimmer with the water all turbulent all around him. 17. Late in the Sycamore football at Liberty I ran up into the stands to make this photo. The stadium looked absolutely amazing during the blue hour. Sometimes during a game I like to get a little landscape work in. This was one of those times. This year starts off with two night games. One at Memorial Stadium in Terre Haute, and the next at Louisville. I need to make another attempt at a photo like this. 16. 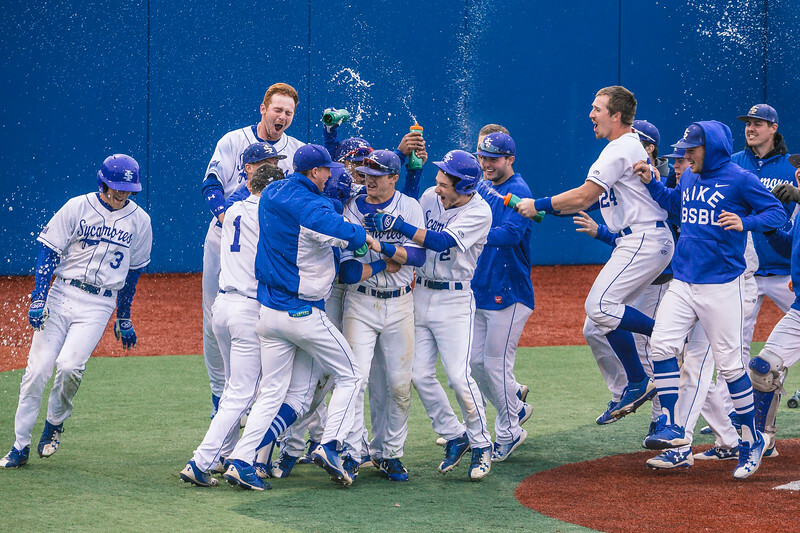 This was a fun year following the Indiana State baseball team. I shot way more than in past years. I had a blast with the team, and I can’t wait until next spring. I think that this team will have something for the rest of the MVC. 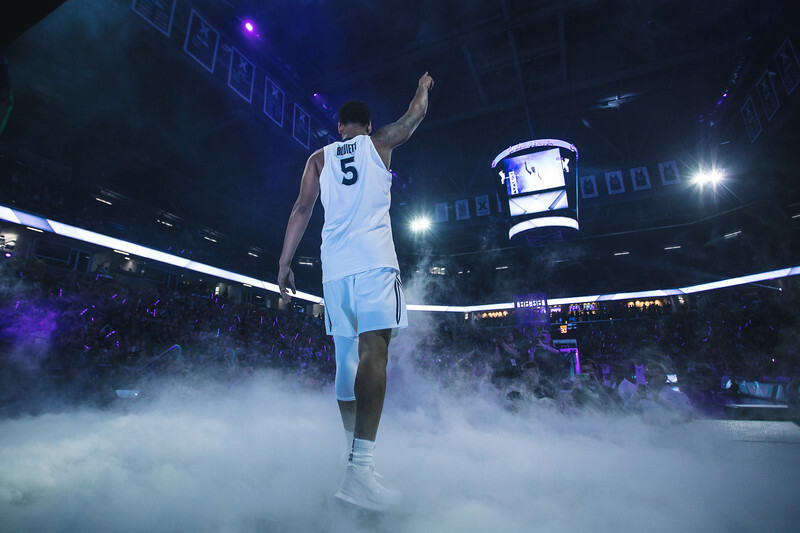 This was my favorite shot of the year as they walked off Xavier. 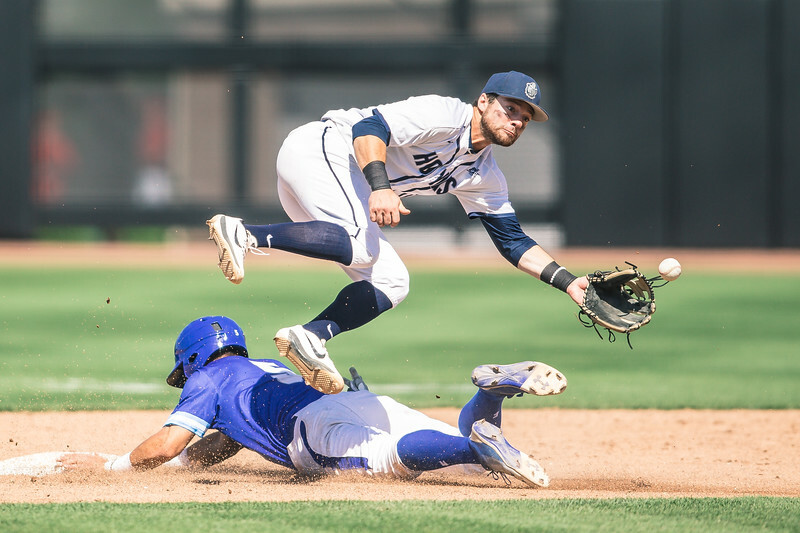 You can view more of my favorite shots from the Sycamore baseball season here. 15. As I said before I sometimes turn into a landscape photographer at games. Here I went to the game with only my wide angle lens. When I left the sky had some great clouds in it that would have been a glorious sunset. The clouds quickly moved out, but the Folk Field sunsets are always amazing. This one was no different. 14. When I attended Purdue Ukari Figgs was doing special things at Purdue. It was a privilege to photograph her as she was honored by the team this past spring. 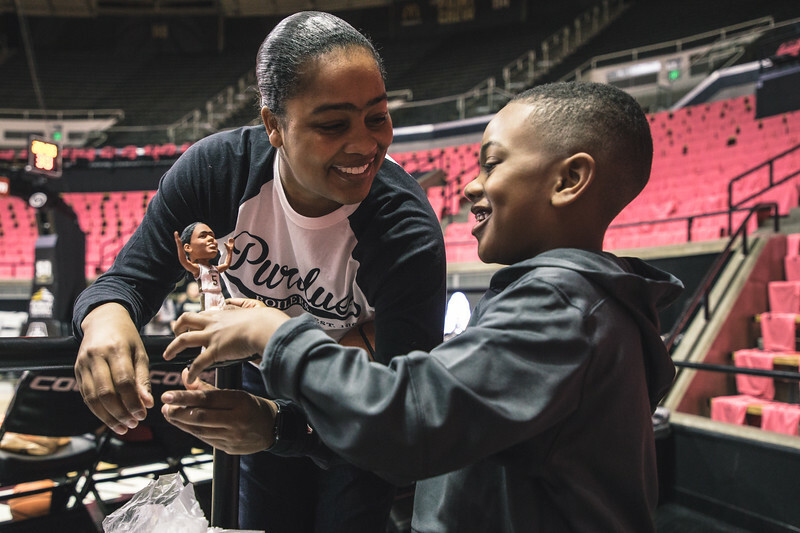 I loved this moment of her proudly showing her son her bobblehead. It is what is great about sports. 13. My basketball season started in Bloomington this past year. I still remember having a conversation on the sidelines at a football practice about this game happening. I was booked before the game was announced. There is a similar situation this year that I am very excited about. 12. Jordan Barnes does amazing things. Sometimes the pressure is on me to show them in a different way. Here I went very wide at the MVC Tournament to do just that. I love traveling to St. Louis for this tournament. Coming away from St. Louis with a special picture makes it even better. This was my third straight year shooting the best of the Valley. My weekend in St. Louis is always a lot of fun. Next year I really want a long weekend in St. Louis though if you know what I mean. One that leads to another long weekend the following week. 11. Sometimes you put in a long day of shooting and you are tired. You just need the final race to be run before you can go home. I was hot and ready to call it a day when I made one of my favorite photos of the championships. When you get a major upset for the team that hired you it gets the adrenaline flowing. I was running all over like a madman while I captured his emotions after the win. 10. I did not have to go far to make this picture. Indiana State came to Purdue in several sports last year. This was one of my favorite moments from those games. 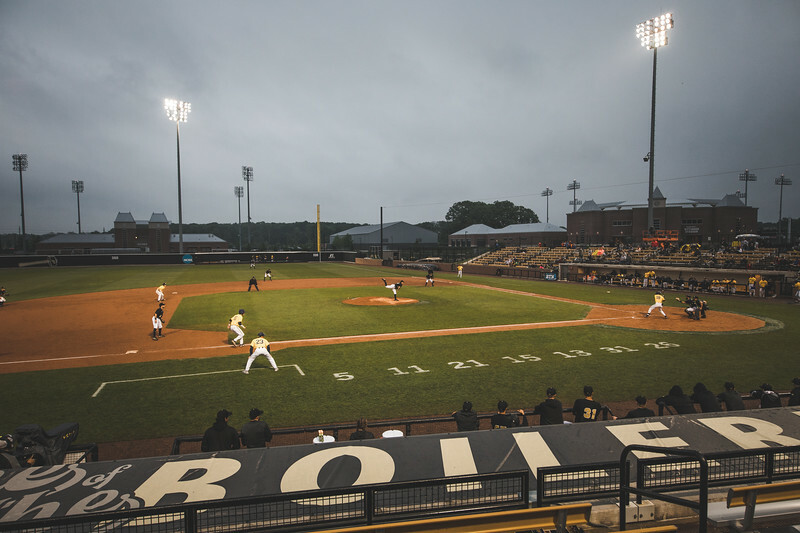 Purdue lost game one of a doubleheader, but came back to win game two. This home run was a big part of that win. I love the emotion by the team in this photo. 9. My run with the Xavier basketball team came to an end in Nashville this season. 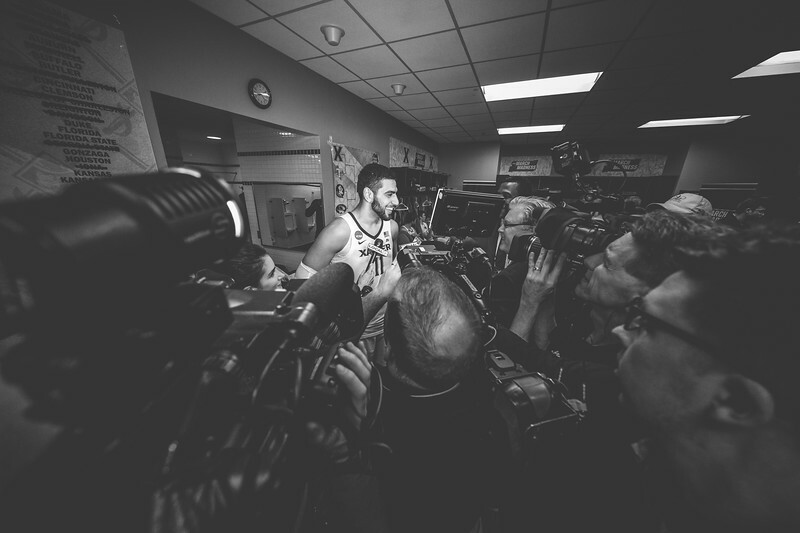 After their first round win I made this photo of the media mobbing a player in the locker room. The TV lights gave me a way to make the photo a little more interesting. One of my Lightroom presets really seemed to make this photo pop. I used it very little on my sports work until this image. This entire spring though has seen it get some use. 8. 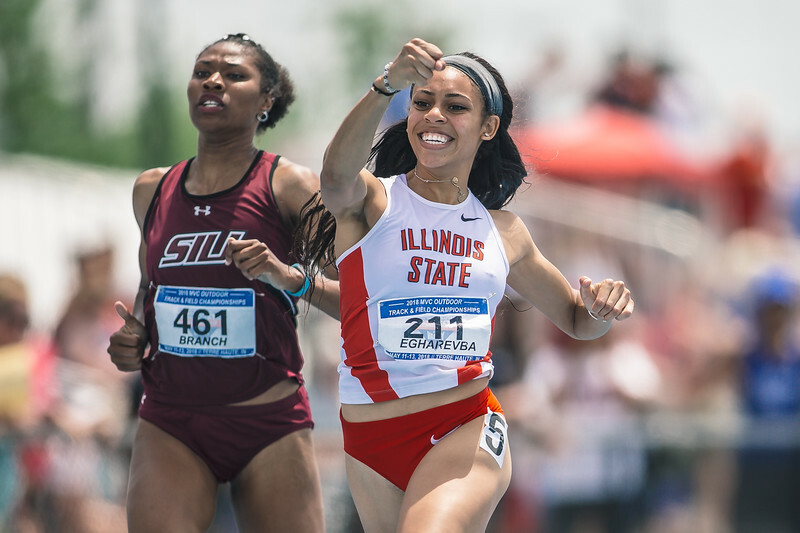 Photographing the MVC Track and Field Championships was a great deal of fun. These are amazing athletes doing amazing things. The emotional moments are awesome as well. This was my favorite of those moments. 7. Luck is always a factor in sports photography. This photo is all about luck. It was luck that I was even there. If Indiana State had won their Friday night MVC Tournament game I would have still been in St. Louis. If Coach Mack had been given a quicker interview outside of the locker room then the team would not have had the time to plan this water surprise. All of that had to happen before I was able to make this photo. It was a fun photo of a great moment as Xavier clinched the Big East outright. 6. 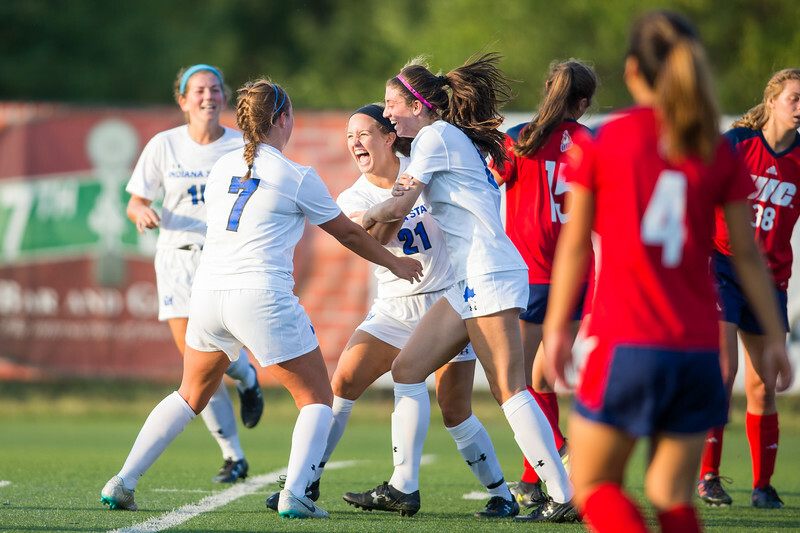 I covered the first Indiana State home soccer match this year because it was the first game of any kind under the Memorial Stadium lights. What I ended up seeing was a great soccer match with a lot of emotion in it. I love just how much emotion is in this photo. A player not expected to score a goal and they score two that is the difference in the game. What a great moment, and I was happy to be there for it. 5. 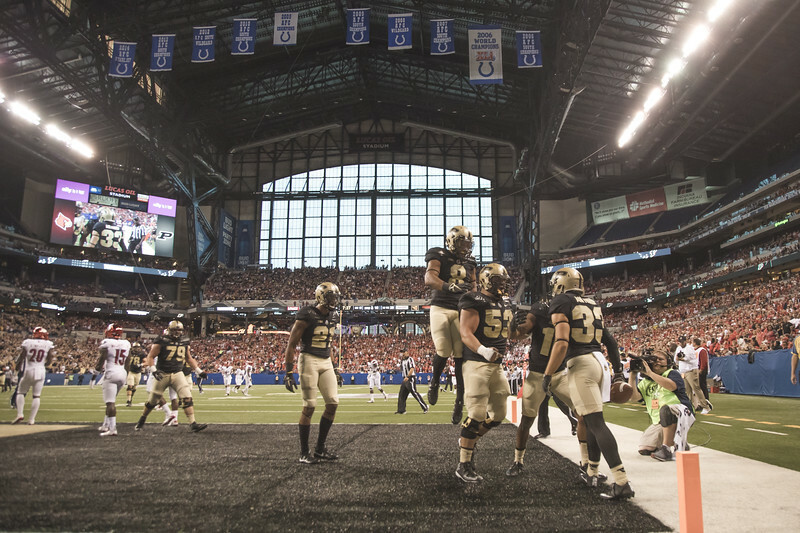 A highlight of the year for sure was shooting the Purdue football game at Lucas Oil Stadium. I lucked out early on as a touchdown celebration was right in front of me. I went low with my wide angle to get a sense of place photo. This was my favorite photo from that game. 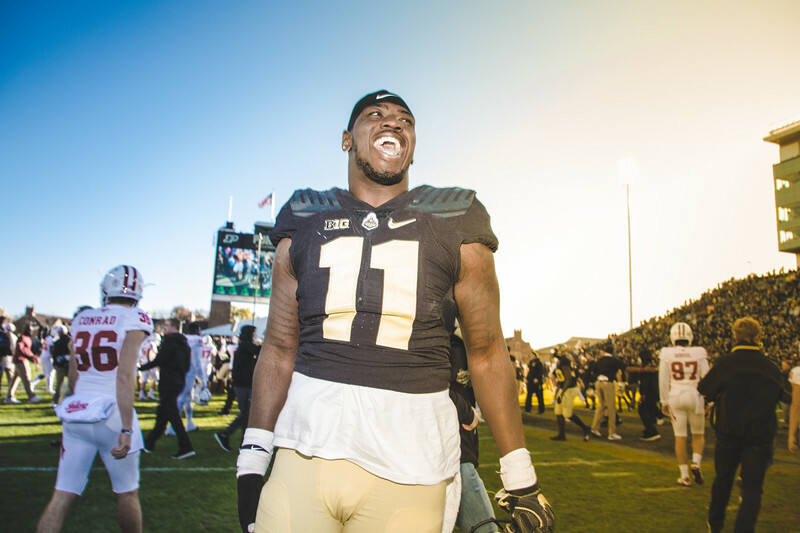 Early on you could see the difference that Coach Brohm brought to Purdue. 4. Here is another photo that I really lucked into. I was standing off to the side ready to shoot the player introductions. I was going to make a boring shot of the anthem from the side. Most of the time the anthem shot is not one to write home about. When I saw the light I quickly moved to the middle of the floor to make the shot above. I had no idea that they did this, but I am glad that they did. This was amazing light that was fun to work with. 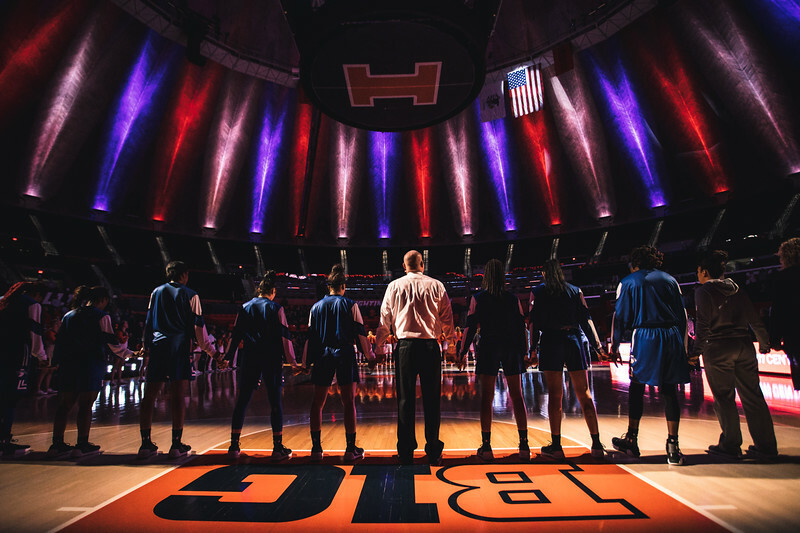 Looking at the floor it looks like you could do something really special with the Illinois team and their reflection. 3. This one might be so high because it is so fresh. I just made this photo at the Big East baseball tournament. I love all of the action in the photo, and the anticipation that the ball being just outside the mitt gives you. This might be my favorite baseball image so far this year. As I write this I figure that I will make this post go live in about a week. Maybe I can make something better in that time. For now this is a fun photo that I will spend the rest of the season trying to top. 2. Speaking of topping a photo I just booked Musketeer Madness for Xavier again next fall. I worked this photo for a couple of players so that I would get it right for the one player I was waiting for. When he raised his finger to the sky I knew a cool shot just got much better. I don’t know how I will top this next October, but it will be fun trying to do just that. This is not my most technically brilliant photo from the last college season. I think that it ranks so high for a few reasons. 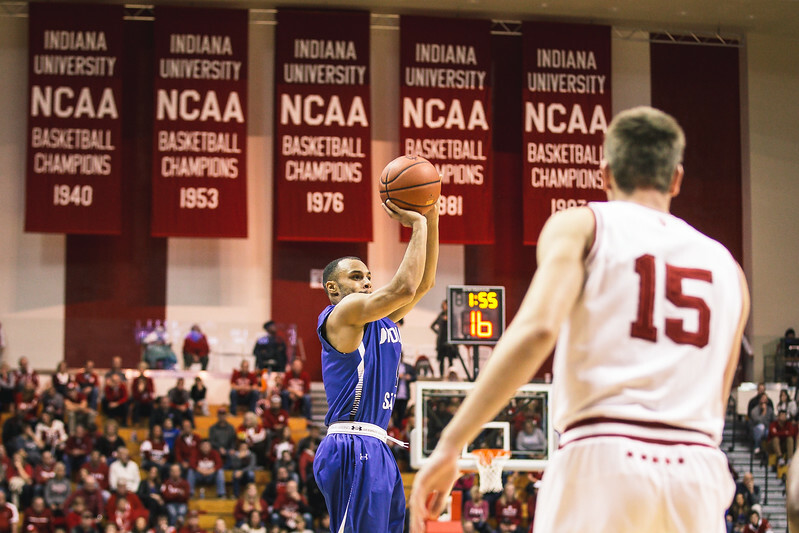 One is it is a nice shot of LaMonte Booker from Indiana State. The main reason though is that it was made at Rocky Top. That was a highlight from last year to be sure. I have always wanted to see a game there, but to be on the field for my first time was really special. Walking onto a field with 100,000 people is something else. Walking backwards and hoping not to fall following your players to the coin toss can be terrifying. This late game shot though always stood out from that game. So there it is. Twenty five photos that help represent a very fun year making pictures. After I wrote the post I went back and looked through all twenty five photos again. I can’t help but think about how far I have come in the five years since I first started shooting from field level. Each year it seems that I make another jump. I can only hope to do that again next year. I can’t wait to put another one of these together to see if I can possibly top this year. Before I go I just want to say thank you again to all of the people that have helped make this year as awesome as it was. As I said at the beginning without the support of a couple of programs this whole experiment might be shutting down at this point. It is hard for me to believe that I could have pulled the trigger on that, but it was something that I felt strongly about. If I am not moving forward then what is the purpose? I definitely moved forward this year. With much of my fall already booked up I am finally in the place that I wanted to be in. I owe a lot to those who have helped me get there.